America’s notorious spy agency, the NSA, has been reaching out to kids with a coloring book about a team of talking animals who love fun, games and ... snooping. “America's CryptoKids: Future Codemakers and Codebreakers” was discovered by Pando Daily correspondent Dan Raile at the latest RSA cryptography and information security conference in San Francisco. The book features a fun-loving gang of talking animals...every one of which is a spy. 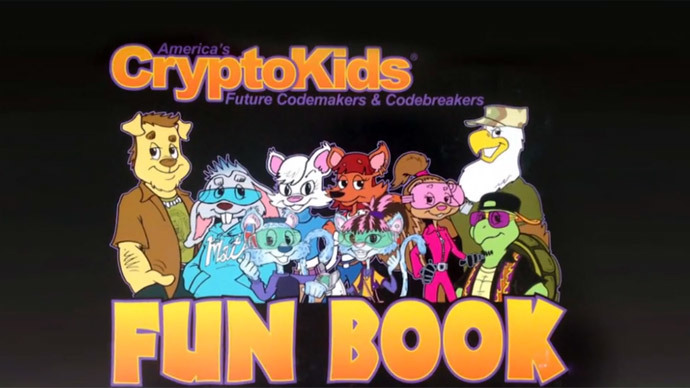 With characters like computer scientist turtle T. Top, cyber-security specialist cheetah Cyndi, signal intelligence analyst Decipher Dog and a half-dozen others, the book is “designed to help children learn about cryptology and NSA’s mission to defend the nation”, according to the NSA website. It was published to back up the NSA website's section entirely devoted to children, which contains extensive backstories for the CryptoKids, as well as even more games mixed with advice on how to stay safe on the Internet. There are also tips for kids who want to become NSA agents themselves in the future. The book’s emergence has provoked a wave of negative comments on Twitter, ranging from calling the book “a waste of resources,” to comparisons to Cold War propaganda to accusations that it is teaching children to spy on their parents. Just a week ago, the NSA unveiled another controversial cartoon character. Earth Day mascot ‘Dunk’, who looks like a man-sized muscular recycle bin with a huge face covering most of its blue surface. While aimed at teaching children the value of recycling waste, Dunk provoked a perplexed reaction on social media. These are not the first efforts made to appeal to children by the US security services. In 1997, a memorandum of the former US president Bill Clinton encouraged all federal agencies to create sections for children on their websites. While the NSA made the best effort, the FBI and CIA are also among the security services that created their own websites to educate children about their missions. Even the Pentagon released the video game ‘America’s Army’ to encourage people to enlist in 2002. Britain's GCHQ also wants to appeal to kids, especially those that could become potential spies in the future. It has developed a colorful app to get teens interested in cryptogrophy. Cryptoy demonstrates “a fun way to break codes someone else thought were secure”. “The hand that rocks the cradle controls the future. Certainly, every society, every government wants to have the children on its side and it wants potentially to recruit some of them into the intelligence services,” says cartoonist Ted Rall, who doubts the efficiency of the NSA cartoons. “These things will be viewed instantaneously as something to be passed around as laughable and funny and cheesy and bizarre,” Rall told RT.